Make Flying Geese Patches quickly and accurately every time with no measuring necessary! Just line up the triangle lines on the ruler with the 45 degree sewn lines and trim the patch the size of the ruler! 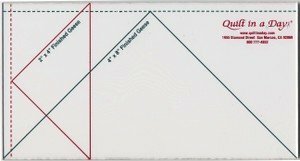 The ruler is designed to make Flying Geese patches in two different sizes: 2" x 4" and 4" x 8". Fully illustrated and detailed instructions are included. Made of heavy gauge acrylic and is laser precise.